from now on... you must talk about.... SAUSAGES! A sausage consists of ground meat and other animal parts, herbs and spices, and possibly other ingredients, generally packed in a casing (traditionally the intestines of the animal), and preserved in some way. There is no consensus whether similar products that are not packed in casings, such as pÃƒÂ¢té, meatloaf, scrapple and head cheese should be considered sausages. Pieces of sausageÃ¢â‚¬â€often not including casingÃ¢â‚¬â€are a popular topping for pizza in many countries. Sausage is a natural outcome of efficient butchery. 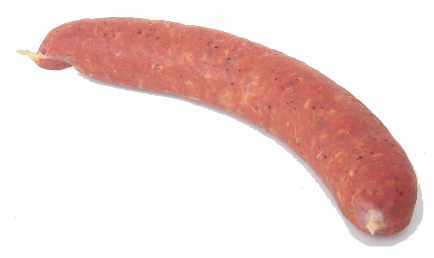 Sausage-makers put meat and animal parts that are edible and usually nutritious, but not particularly appealing, such as organ meats, blood, and fat, to good use, and allow the preservation of meat that can not be consumed immediately. Hence, sausages are among the oldest of prepared foods. Actually, he hears the trolls wife talking to the trolls baby about how the baby will get some new toys the next day (the new toys being the guys eyes).